Well you can come up all kinds of catch-phrases for this one: Janine “cops a feel” is the best one I can come up with off the top of my head. part-time Perry Township Officer Janine England (R). 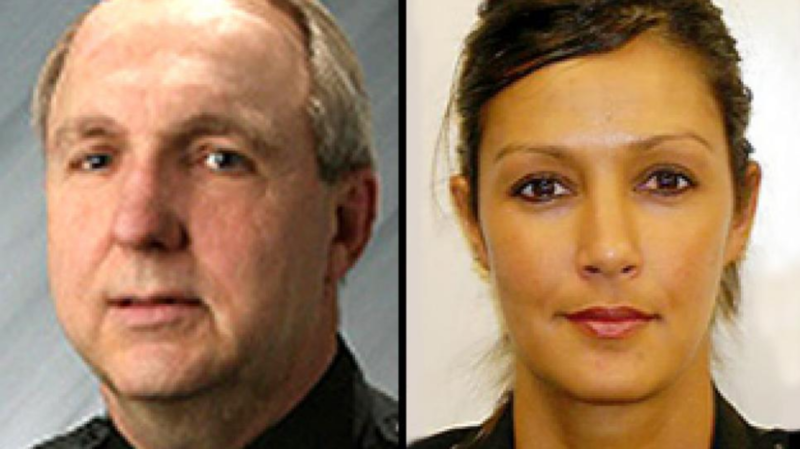 The incident took place on June 2, when then-Perry Township (Ohio) Police Chief Timothy Escola and a subordinate female, part-time officer, Janine England, were transporting a man suspected of burglary in their police cruiser. What happened during the ride…well, watch for yourself. Escola, who is married with three kids, resigned from his position earlier this month once an “anonymous tip” prompted review of the tape. I’m not one to kick a man while he’s “down,” but…well, nevermind. England says she resigned, but Perry Township trustees say they fired her. She had only been with the department since April. This anonymous tip is the most peculiar part of this story. The man they were transporting in the back seat, 28-year-old Matthew Ruble, may be the smoking gun source, being he’s now pursuing legal action against the police for endangerment. You can actually see England looking in the backseat several times to make sure Ruble was asleep. It may also be possible that England framed the chief, being the dash cams in those particular cruisers are only activated either when the sirens are turned on or when they are “manually turned-on” (sorry, couldn’t resist). All she had to lose was a part-time job, while he had a career to lose. If these two were stupid enough to perform their adulterous infidelities on taxpayer time in a police cruiser, than any subsequent ribbing they receive is deserved. Make no “bones” about it. This entry was posted in U.S. and World News on July 22, 2009 by admin. What’s sad are the circumstances. These two look like they really care for each other, and you can see the genuine affection in this obscure video. We should all be so lucky to find someone in life that makes us want to behave this way with each other. The circumstances (the fact that he’s married and her boss) make the relationship taboo, but to treat them like dirt for happening to fall in love is worse. Just my opinion. Nice site btw. I don’t believe true affection is at question. Many women, known as “Badge Bunnies,” socialize with officers, regardless of their marital status, and some even bcome reserve or full-time officers. I would be curious to know if in fact Ms. England was a part-time employee, AND whether she was on probation, which might speak for her rights (or lack thereof). Most police departmental (city) policies allow for the dismissal of probationary employees without cause. I don’t understand why people immediately hide behind the protected statuses. As for the chief, it may not be correct, but he put in for retirement when he saw his back against the wall. Unfortunately, those are the politics involved when you have a tenured employee; it’s toocommon in the law enforcement field, not that it makes it okay.